You know when you walk past a restaurant that seems really nice and you think "I'm definitely going to try this some day" or when you see a book you really want to read and say to yourself: "I'm going to start reading this as soon as work slows down a bit"? Inevitably, you don't manage to eat at that restaurant or read that book for a VERY long time, no matter how much you want to. That was the case with me and the We Should Cocoa Blog Challenge. Every month, the challenges seemed so interesting and mouth-watering. And every month, either I had papers to write, exams to study for, work to go, events to manage, or some odd amalgamation of all of the previous (which was most likely what happened). 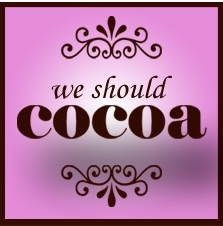 Anyways, I never got to participate in the We Should Cocoa blog challenges even though I really, really, really wanted to but this month, I did. This month's challenge is hosted by the lovely Chele of the The Chocolate Pot. I think what really pushed me to make this was that the theme was "chocolate masterpiece". "Masterpiece!" I thought. Oooh yess, time to spin toffee and melt fondant and create a wonderful chocolate swan in a stainless steel kitchen with my chef's hat and whites. I got all sorts of ideas (I always do). Alas, attempting to be creative is what drives me more often than not. And a masterpiece automatically means that it has to be presented with some pomp and show does it not? Masterpieces, after all, fit in perfectly with celebrations. And so, I decided to make a chocolate 'masterpiece' cake for the first birthday of our food bloggers group. Famished in Arabia, or TableTalk as it is now known, was formed a year ago by Arwa @ I Live in a Frying Pan and Sally @ My Custard Pie . They decided to collaborate and form a UAE-based food bloggers group. The group has now grown to over 60 members and is such a wonderful network between all of us who love to love to share our love of food. I have made some wonderful friends this past year thanks to our group and have created some lovely memories. We constantly share our posts with one another and always have one fun event or another coming up. I'll always remember when we made gingerbread biscuits at Sally's, or had a picnic in the park, or Iftar at Sukaina's, or took a Thai cooking class, or had a mini chocolate fest at my place. And now I'll remember our epic first birthday celebration. We raided the first floor of the wonderful Tea Junction today and had our cake-a-thon celebrating our first birthday. Each one of us was supposed to bring a cake (which resulted in some two dozen cakes!). And so, quite aptly, I decided to make this triple chocolate cake. Another reason I made this cake is because I wanted to tie a bow around it this time. I made a similar cake two weeks ago (topped with berries instead) as a birthday cake for a friend who absolutely refused that I add a ribbon. But I had to have my ribbon. And so I made this cake again albeit slightly differently. The last one was a 9" double layered chocolate cake with milk chocolate finger biscuits around it. The topping was a mixture of heavy cream and whipping cream and was topped with berries. This one, in contrast was a 5" single-layered chocolate cake, with chocolate buttercream, milk and dark chocolate fingers, and semisweet chocolate chips. I am not joking when I tell you that the decoration part of this cake took exactly 10 minutes. It is SO much easier than simply coating a cake with frosting. SO MUCH EASIER! Preheat the oven to 170C and grease and base-line a 5" cake tin. Place together the flour, sugar, cocoa powder, baking powder, and butter in a large bowl. Mix until well combined. In a small jug, beat together the egg, milk, and vanilla extract. Pour half of the milk mixture into the flour mixture and mix until well combined. Add the other half and beat for two minutes until all mixed together. Bake in the middle rack of the oven for 30 minutes or until a skewer inserted in the middle comes out clean. Meanwhile make the frosting by mixing together the icing sugar, cocoa powder, and butter until it reaches a sandy consistency. Gradually add the milk and beat for 5 minutes until buttercream is fluffy. Place the cake on an icing turntable and with a spatula, apply frosting only around the sides of the cake. Apply just enough so that the fingers can stick on comfortably. Once the sides of the cake have been coated with the buttercream, carefully place the chocolate fingers all around alternating between the milk and dark chocolate fingers. Once that's complete, place the remaining chocolate frosting in a piping bag fitted with a Wilton 98 nozzle and pipe around the edges of the inside of the cake. Complete by filling the middle of the cake with the piped frosting. The best way to achieve this look is by arbitrarily piping across the center of the cake. Sprinkle the top of the cake with the semisweet chocolate chips. Refrigerate the cake for 20 minutes until relatively hardened before tying the bow across the cake. Try to make the bow look neater than mine. Cake looks simply out of the world. How I wish I was there to have a slice of it. This cake had all the chocolate goodness in it! I'm very thankful as well that I met wonderful people via FIA. I LOVED how you decorated this cake, simply beautiful, ribbon and all! Took this home and dad enjoyed it too! It tasted as good as it looks. One of your best Sid. What fun to have two blogging events to celebrate and at the same time too. Glad you finally made it to a We Should Cocoa event. Your cake looks amazing and I love the ribbon. Thanks so much for coming to the party! 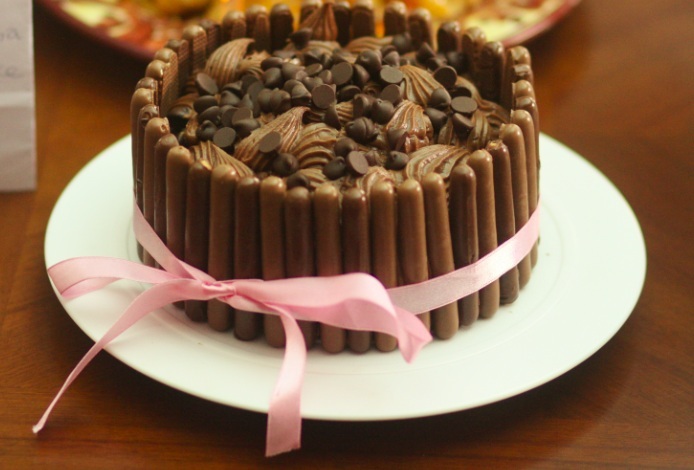 im going to be making this cake soon! Can i use granulated sugar in place of the caster sugar? you can use granulated sugar although the texture of the cake will be a bit different. If you have a food processor, try grinding the granulated sugar in it for a while- that'll make the texture of it more fine. This is lovely! I've just found you through Pinterest. I'm making this tomorrow! I leave a response each time I like a article on a site or I have something to contribute to the conversation. some questions for you if you don't mind. Is it just me or does it look like like some of the responses appear like they are left by brain dead individuals? :-P And, if you are posting on other online sites, I would like to keep up with you. Would you list all of your shared pages like your Facebook page, twitter feed, or linkedin profile? know-how, therefore it's pleasant to read this weblog, and I used to visit this website all the time. wound up here "Triple Chocolate Party Cake". if you are writing on other online sites, I would like to follow anything fresh you have to post.